From the Late Permian onwards, the separation of the European and North American continental plates led to the creation of the North Atlantic Ocean. As part of the European Plate, Northern Ireland experienced tensional tectonic stress, which caused crustal subsidence onshore and offshore and was a major factor in the development of two distinct groups of fault-bounded Mesozoic sedimentary basins  . An outer group of basins with a predominantly northeast-southwest orientation developed in the area referred to as the ‘Marginal Belt’, which stretches approximately 150 km offshore to the edge of the continental shelf. Sedimentary basins that developed onshore in Northern Ireland and Great Britain are referred to collectively as the ‘Clyde Belt’, and belong to an inner group of basins typically with a northwest-southeast or NNW-SSE orientation (P947877). These onshore basins formed in response to ENE-WSW stretching, producing half grabens by dip-slip reactivation of existing Caledonian structures . The present outcrop of Permian and Triassic strata in Northern Ireland is restricted to the periphery of the Antrim Plateau (P947841). However, regional gravity surveys and exploratory drilling have identified sedimentary basins concealed beneath the Palaeogene Antrim Lava Group of the Antrim Plateau (see Mantle plumes, ocean spreading and the North Atlantic Igneous Province, Palaeogene extrusive igneous rocks article and (see Geophysics and concealed geology article). Significant depocentres including the Lough Neagh and Larne basins are infilled mainly by Permian and Triassic rocks , (5, 6), . The presence of concealed Carboniferous lithologies has been confirmed in the Lough Foyle basin by the Magilligan borehole . Both the Rathlin and Lough Foyle basins are post-Variscan transtensional half-grabens with a sedimentary fill consisting mainly of Permian and Triassic strata. 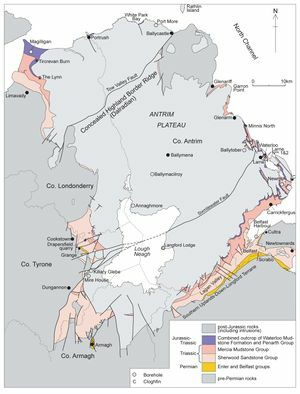 The Rathlin Basin formed in response to extension along NNW-SSE trending faults in the area between the Tow Valley and Lough Foyle faults . The basin extends northwards offshore beneath Rathlin Island and southwards to the Tow Valley Fault. Gravity modelling suggests that the deepest part of the basin is located close to the Tow Valley Fault with an estimated 2000 m of Mesozoic sediment . The Lough Foyle Basin is bounded by a northeast-southwest trending fault tracing the northwest shore of Lough Foyle while the basin extends and deepens to the southeast beneath the Lough. East of Lough Foyle, the basin is concealed beneath the Antrim Plateau. The Magilligan borehole encountered 806 m of Triassic strata overlying 350 m of early Carboniferous coal-bearing strata. Gravity modelling suggests that the Carboniferous section may be in the order of 800 m thick. In south central Co. Antrim, the Lough Neagh Basin is largely concealed by Palaeogene basalt lava of the Antrim Plateau. The asymmetric form of the basin is structurally controlled along its southern flank by northeast-southwest trending faults and resembles the southern part of the Rathlin Basin. Gravity modelling predicts a total basin depth of almost 4 km. The stratigraphy of the basin has been tested in the Ballymacilroy and Langford Lodge boreholes , . 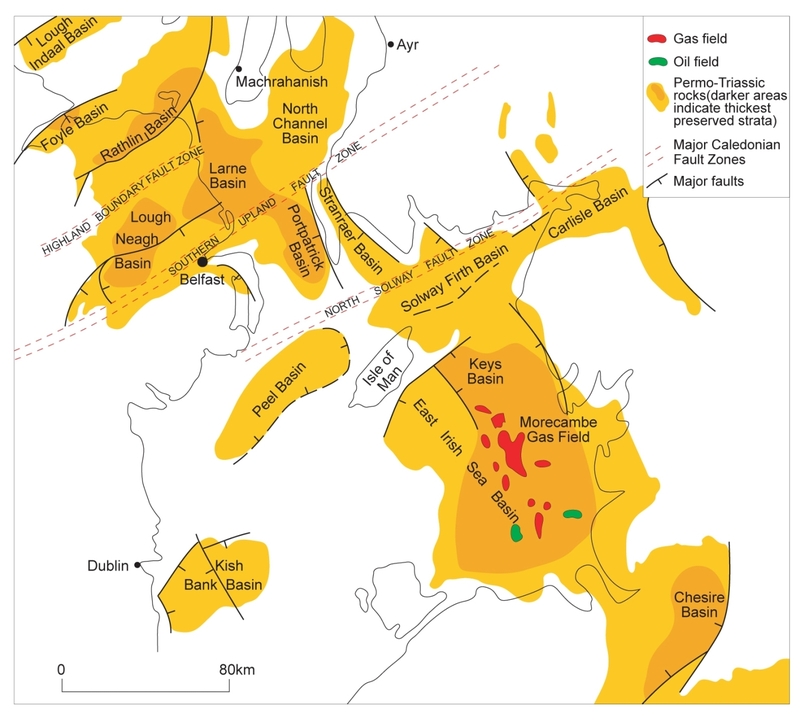 Exploratory drilling in the Larne Basin in southeast Co. Antrim (Larne No.1 and No.2 boreholes) demonstrated 3000 m of Permian and Mesozoic strata . Exposed rocks of Triassic-Cretaceous age occur in the Larne area, but the remainder of this basin is concealed beneath the Antrim Plateau. A gravity model has determined an oval geometry for the concealed basin with a depocentre located just north of Larne and extending offshore to the northeast. Although the basin initially subsided in the Permian along pre-existing northeast-southwest (Caledonian) fractures, the outcrop pattern of Triassic and younger rocks in the Larne area indicates that later subsidence was influenced primarily by NNW-SSE trending normal faults. Triassic to Cretaceous rocks in this area dip regionally towards the northwest and are exposed along the north side of Belfast Lough and extend southwestwards beneath Belfast and the Lagan Valley. 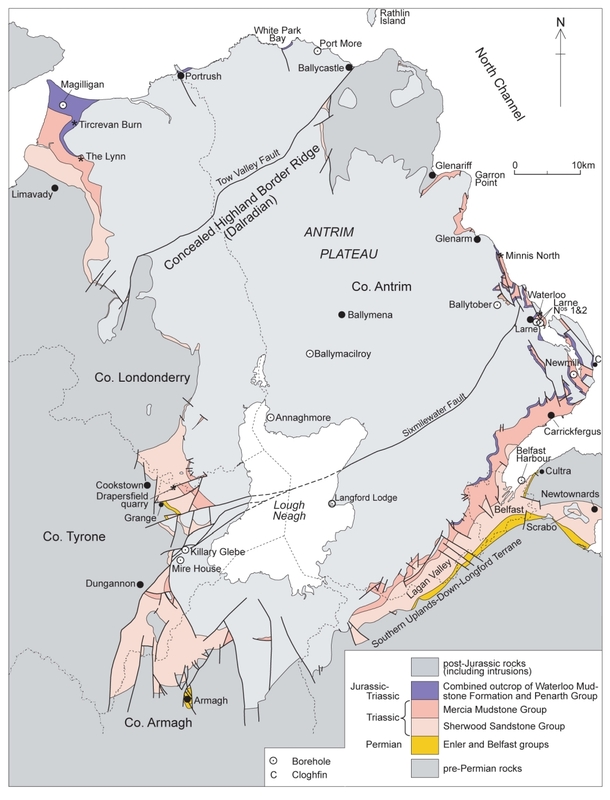 Although up to 1000 m of Permian and Triassic rocks rest unconformably on the Southern Uplands-Down-Longford Terrane on the south side of Belfast Lough and the Lagan Valley, the location of the main depocentres is poorly constrained. The unconformity is modified and displaced by northwest-southeast trending faults. This basin lies between Comber and Newtownards and transects the Caledonian structural grain of the Southern Uplands-Down-Longford Terrane thus resembling the Permo-Triassic basins in the Southern Uplands of Scotland . Subsidence was controlled by extension on northwest-southeast trending faults which developed in this terrane in both Northern Ireland and Scotland during an early phase in the opening of the Atlantic Ocean . The Newtownards Trough is a half-graben that is believed to contain between 500–700 m of Permian and Triassic rocks  although the oldest strata may be equivalent to the thin succession of early Carboniferous rocks exposed at Castle Espie in the northwest part of the basin (see Carboniferous article). The easterly-directed regional dip and asymmetrical nature of the Bouguer gravity anomaly indicate that basin subsidence was accommodated by syn-depositional movement on the Newtownards Fault . ↑ Kent, P E. 1978. Mesozoic vertical movements in Britain and the surrounding continental shelf. In: Bowes, D R, and Leake, B E (eds.). Crustal evolution in northwestern Britain and adjacent regions. Geological Journal Special Issue No. 10, 309–24. ↑ McLean, A C. 1978. Evolution of fault-controlled ensialic basins in northwestern Britain. In: Bowes, D Rm and Leake, B E (eds.). Crustal evolution in northwestern Britain and adjacent regions. Geological Journal Special Issue No. 10, 325–46. ↑ 3.0 3.1 Anderson, T B, Parnell, J, and Ruffell, A H. 1995. Influence of basement on the geometry of Permo-Triassic basins in the northwest British Isles. In: Boldy, S A R (ed.). Permian and Triassic rifting in Northwest Europe. Geological Society Special Publication No. 10, 103–22. ↑ 4.0 4.1 4.2 Carruthers, R M, Cornwell, J D, Turnbull, G, Walker, A S D, and Bennett, J R P. 1987. Interpretation of the Bouguer gravity anomaly data for Northern Ireland. Report of the Regional Geophysics Research Group British Geological Survey, No. 87/5. ↑ Bennett, J R P. 1983. The sedimentary basins in Northern Ireland. Institute of Geological Sciences, London. ↑ Geological Survey of Northern Ireland, 1981. Limavady, Northern Ireland Sheet 12 and part of Sheet 6. Solid. 1:50 000. (Southampton: Ordnance Survey for the Geological Survey of Northern Ireland). ↑ Kerr, I D V. 1987. Basement/Cover structural relationships in the north Antrim area, Ireland. Ph.D. Thesis, The Queen’s University of Belfast. ↑ Thompson, S J. 1979. Preliminary report on the Ballymacilroy No. 1 borehole, Ahoghill, Co. Antrim. Geological Survey of Northern Ireland, Open File Report No. 63, Belfast. ↑ Manning, P I, Robbie, J A, and Wilson, H E. 1970. Geology of Belfast and the Lagan Valley. Memoir of the Geological Survey of Northern Ireland. Sheet 36 (Northern Ireland). ↑ Bott, M H P. 1978. The origin and development of the continental margins between the British Isles and southeast Greenland. In: Bowes, D R, and Leake, B E (eds.). Crustal evolution in northwestern Britain and adjacent regions. Geological Journal Special Issue No. 10, 377–92. ↑ Geological Survey of Northern Ireland 1989. Newtownards, Northern Ireland Sheet 37 and part of sheet 38. Solid Geology. 1:50 000. (Southampton: Ordnance Survey for the Geological Survey of Northern Ireland). This page was last modified on 25 September 2017, at 13:57.